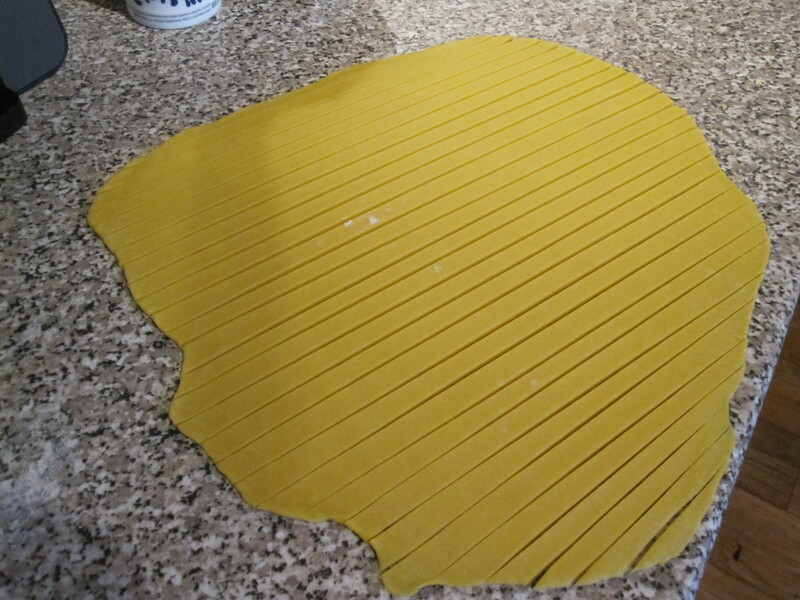 Over the summer I discovered just how easy it was to make my own pasta. I kept meaning to write out a step by step but somehow just never got around to it. Well, today is the day for clearing up loose ends so I thought I’d better get on with it! Also, I got a pasta machine for Christmas so I doubt I’ll be making it this way again. 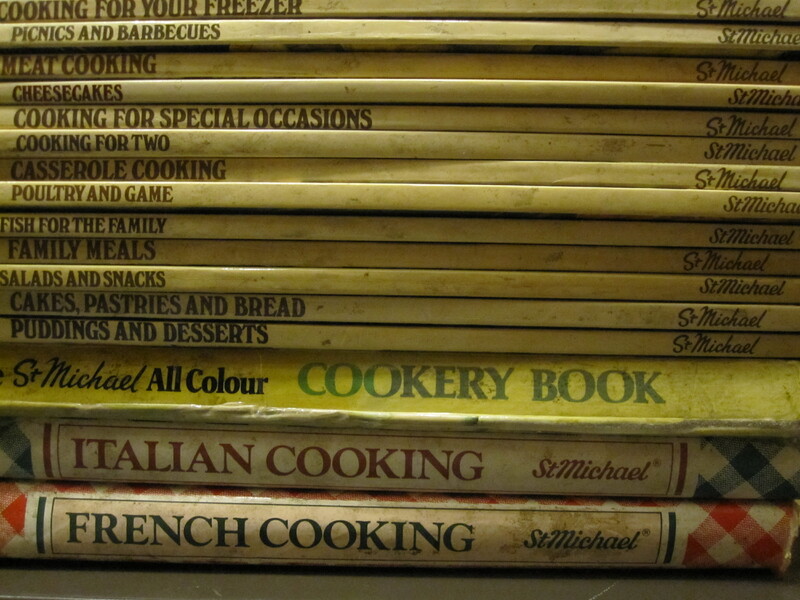 No doubt I’ll be posting another recipe for the machine method next year! Now one of the great things about this recipe is that you can scale it up as you wish. You can also make extras, dry it and save it for later. Start with your flour and your egg. 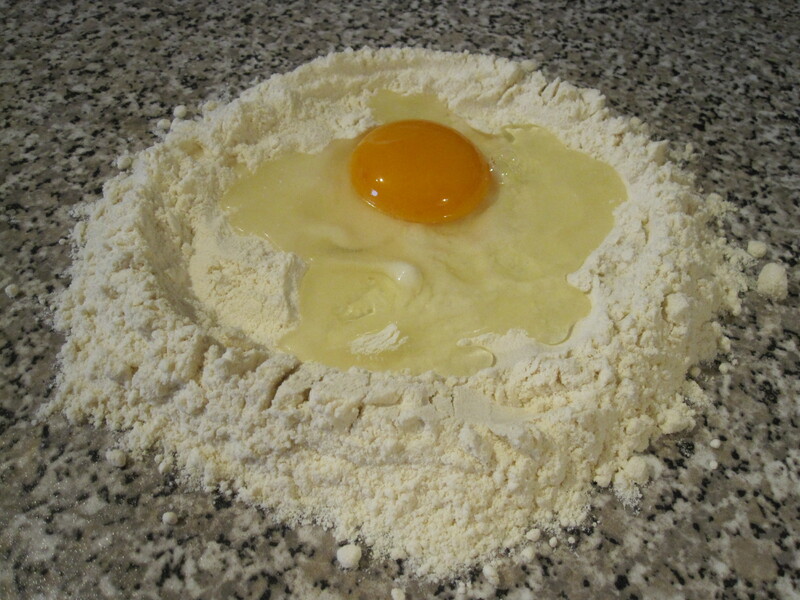 – On a clean worksurface make a well in the flour and crack the egg into the centre. – Use your fingers to work the egg into the flour until you have a dough. Mix until it comes together as dough. – Knead the dough for about 10 minutes until it is soft, supple and elastic. – Leave the dough to rest for 20 minutes. 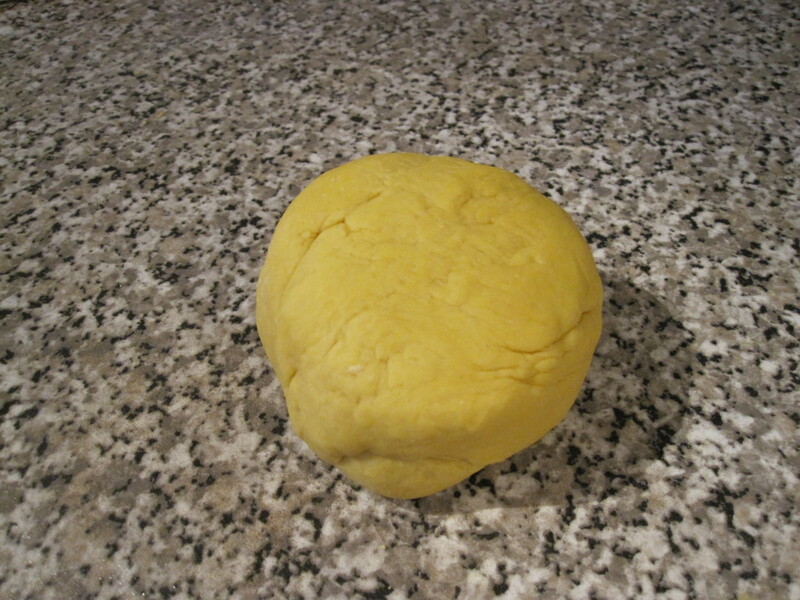 – Roll the dough out to a thickness of less than 1mm. It will swell when you cook it so make sure it is good and thin. – Cut the dough into strips, you can use your rolling pin to keep the lines straight. 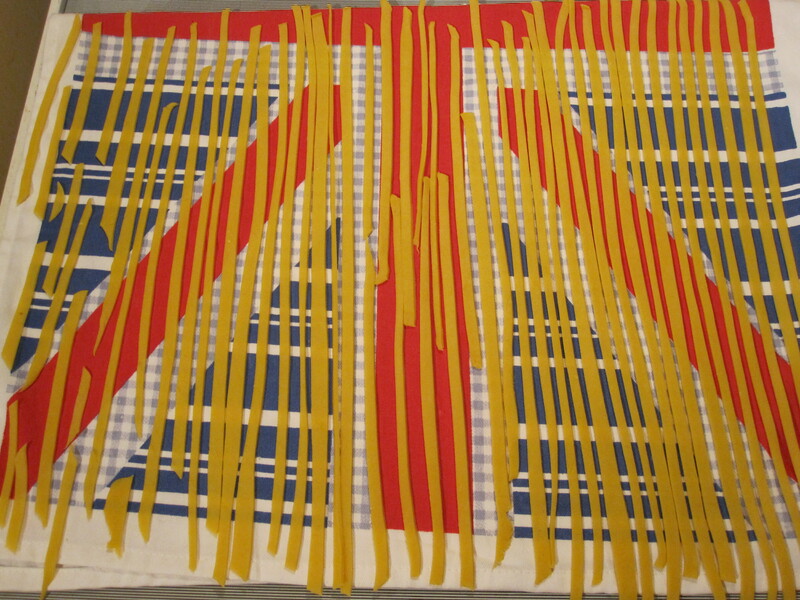 – Separate out the strands of pasta and lay on a tea towel. – If you want to dry it for later use then it’s easiest to coil bundles of the pasta in nests until dry then store in an airtight box. – Cook in boiling salted water for 6 minutes. Drain and serve as you wish. End result: yummy pasta with whatever you like on top! 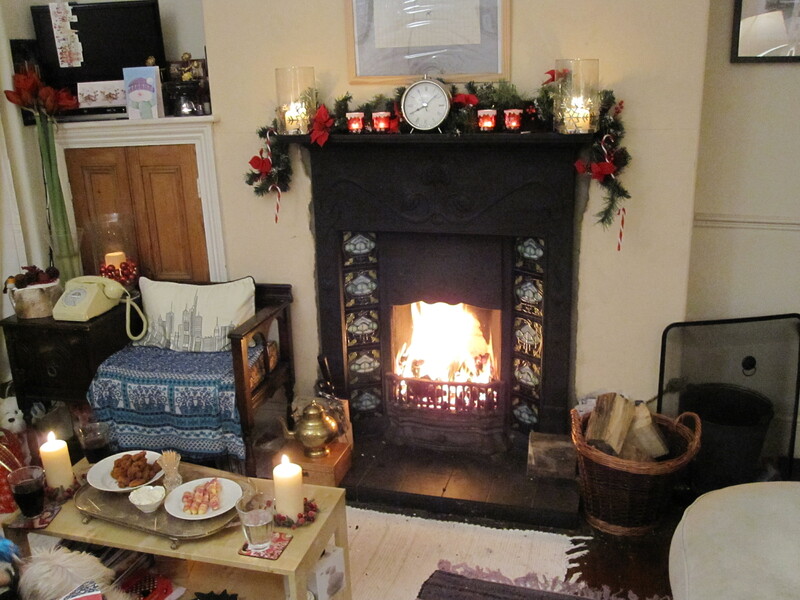 I had a roaring fire and the whole house was as warm and welcoming as I could wish. This was my first opportunity to really show it off so I did the traditional and hid everything I usually have lying about in the spare room! Then on to the main event, Dinner! We started with Buttered Mushrooms and crust bread. Again, I didn’t cook the bread myself because, again, sanity prevailed! Then on to our main of Turkey Wellington. I may Wellington more things in the future because, despite being tricky overall, it wasn’t actually all that hard when you broke it down. And it certainly had the “wow” factor! 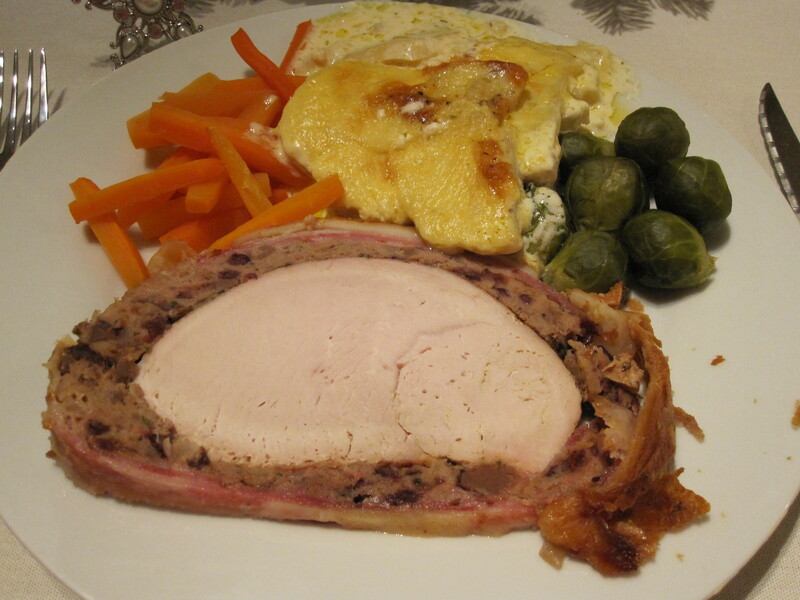 I served this with brussel sprouts, batons of carrot and celeriac dauphinoise. Oh calamity! I dropped the dauphinoise on the floor! Upsidedown! In the pile of sweepings I’d just done! I fair turned the air blue! But, no matter, I still had half a celeriac! Thank goodness for huge root vegetables and my buying extra of almost everything “just in case”! 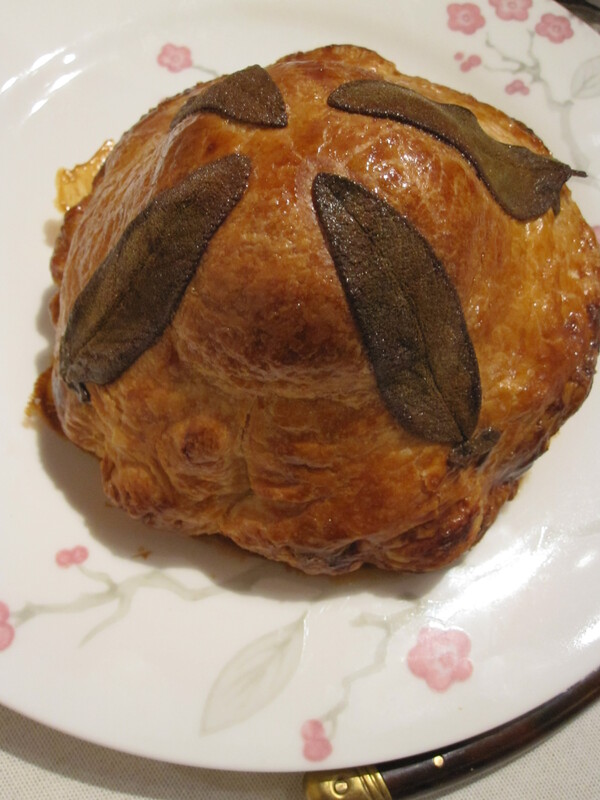 My sister, the obligatory vegetarian, had a main of Butternut Squash and Sage Pithivier, the recipe for which I shall post soon. She certainly seemed to like it but with ingredients of puff pastry, butternut, marscapone, sage and garlic it seemed a fair bet! 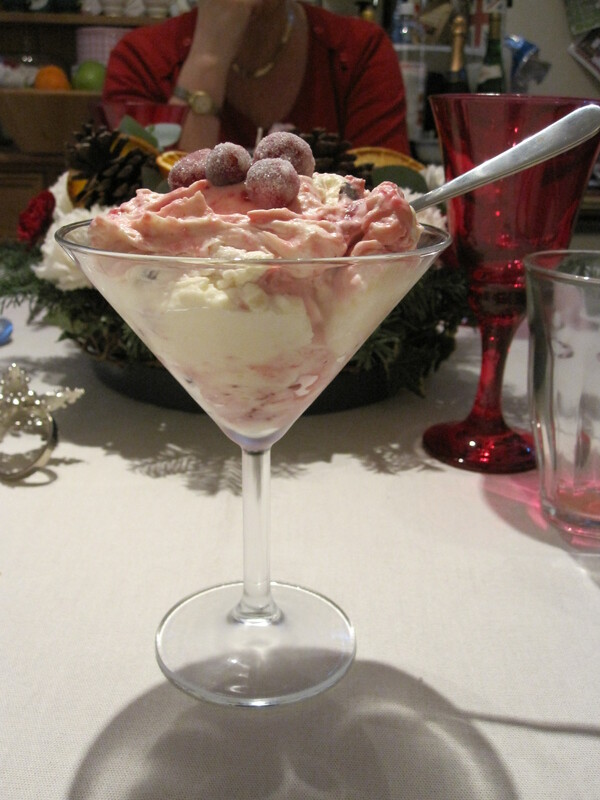 And for dessert the gorgeous, stunning and oh so simple Cranberry Fool! 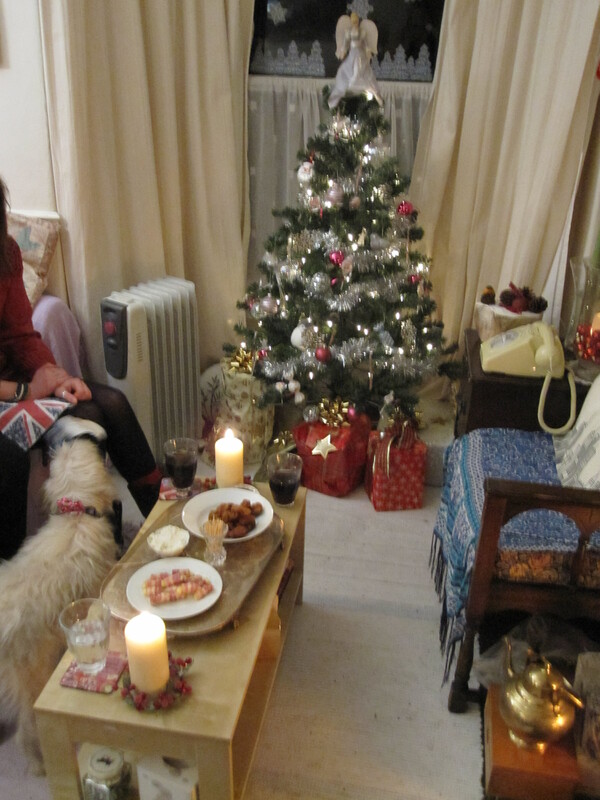 All followed by a shared sliver of Christmas cake. We were all stuffed but I knew if we didn’t cut into it then I would just sit looking at it going, “oh, no, it’s too pretty to cut just for me!” So we bravely gobbled down a morsel each! I had an absolutely lovely evening. It was worth all of the stress, panic and chaos. This is my first proper home, something I’ve always wanted and to have all of my family round and to be able to show off this home I have made myself and have somewhere that is so uniquely mine in the first place means an awful lot! Now that I’ve got the hang of this entertaining lark I’ll have to do it more often! So who’s coming to dinner? For the starter for my pre-Christmas Dinner I needed something I could prep ahead, that was vegetarian and that we all would enjoy! I settled on this recipe because it fit all of the criteria, however, I really should have read the recipe, serves 8! When you think about it (I was too stressed to think!) it is basically butter, very, very tasty butter but still, no one needs a whole ramekin of butter! (Except my Dad it would seem, who ate the whole of his!) I have a lovely set of mini ramekins, which would have been the perfect vehicle for this but no matter, I’m not objecting to keeping the leftovers. Oh, I can already imagine this simply stired through some plain pasta with a sprinkling of parmesan! Delish! 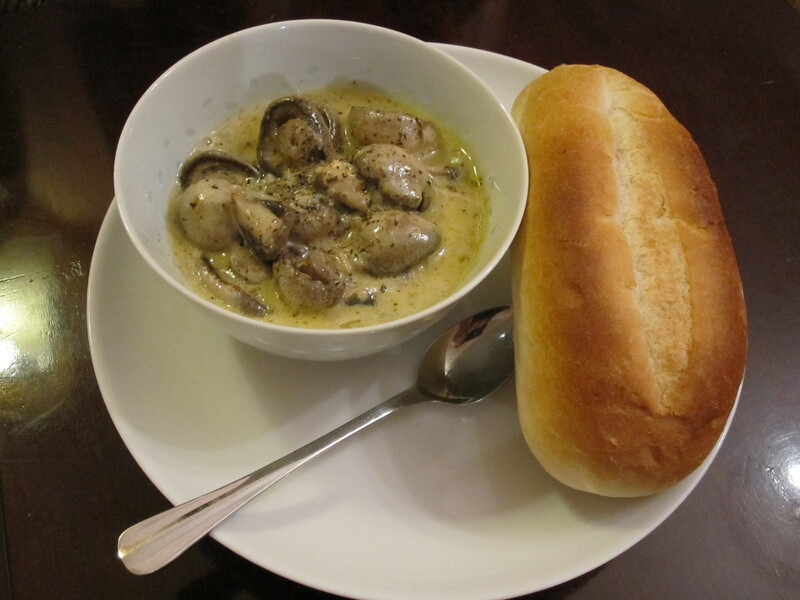 – Soak your mushrooms in a pint or so of boiled water. Then drain them then chop, keeping the stock for something else as it’s too good to waste! – Melt 50g of the butter in a large pan then add the onions and fry until soft. – Add the garlic and your sprigs of thme and cook for another minute or two. – Add both your mushrooms and stir well so they’re coated. Cook for about 10 minutes until soft. – Add the brandy and lemon juice and cook until no more liquid remains. – Turn off the heat, stir through the parsley and season to taste. I’d add a fair sprinkling of salt as mushrooms need it. I’m also keen on a hefty grind of pepper. – Leave the mushrooms to cool. – Once cool, fish out your thyme sprigs. – Soften your butter so it’s just on the point of melting. You can either use the defrost setting on the microwave or beat, beat, beat it! – Mix the mushrooms into the butter then divide between 8 ramekins/bowls/teacups, whatever! – Chill until set but take out of the fridge 30 minutes before you want to serve it so the butter softenes to spreading consistency. 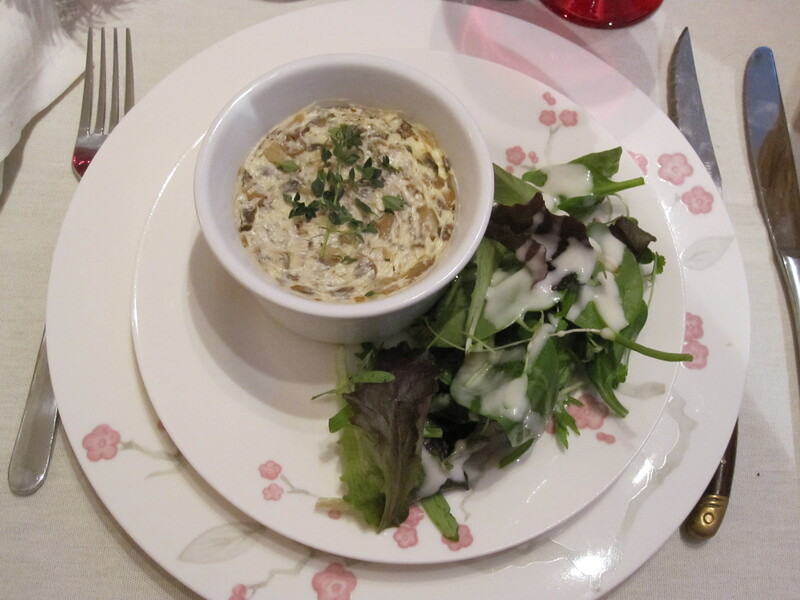 – Serve with a small salad and crusty bread rolls. 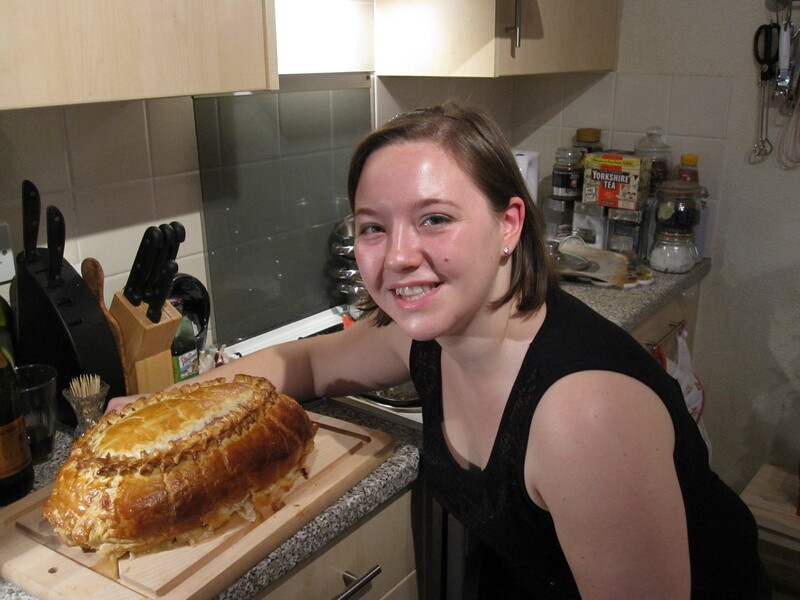 Ok, the pièce de résistance for my pre-Christmas dinner the Turkey Wellington! I wanted to serve something that was traditional, so Turkey, but I didn’t want to do a whole turkey because that’s for Christmas dinner at my parents’. I also wanted something really show offy! Now, this dish is complicated. But none of the steps are, in and of themselves, complicated. It’s just a matter of following the process through a step at a time. Now, to break this down I even stopped to take photos, my camera loves flour, really! – First take your turkey breast and remove the skin and any gross bits. (Yes, I’m 5). 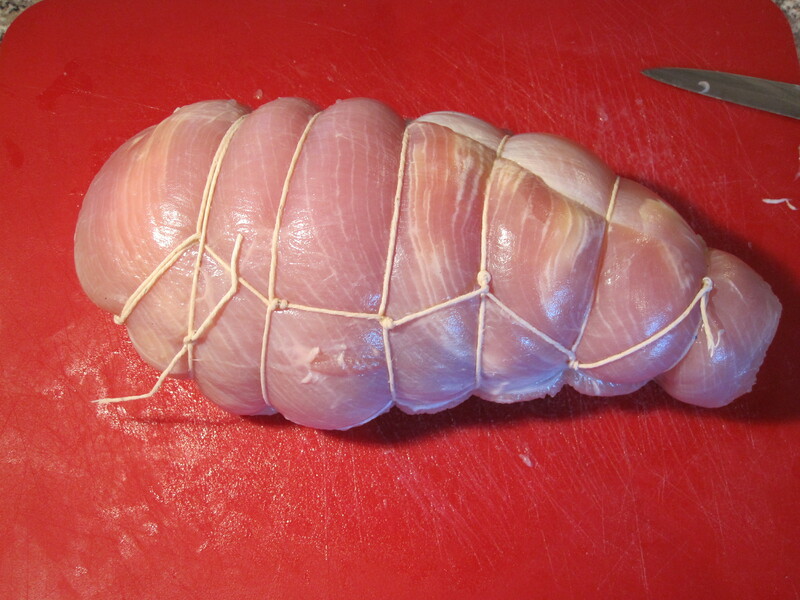 – Then trim the breast to make it more of a cylinder. Trim and tie your turkey breast. – Heat a few tablespoons of oil in a very large frying pan. 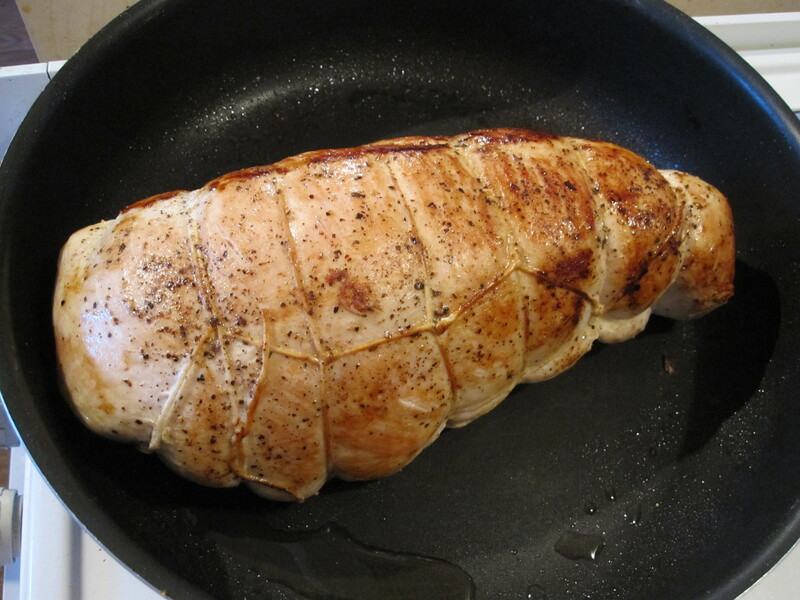 – Season the breast then place in the pan and brown evenly on all sides. – Set aside to cool. Pan fry the breast until golden brown. – Now for the stuffing! – Melt a knob of butter in a frying pan. – Add the onions and cook til soft. Leave to cool. 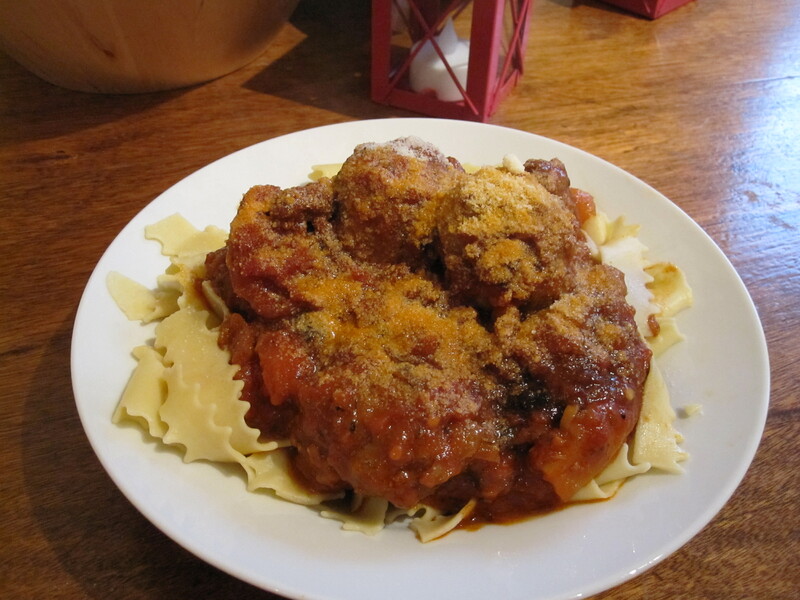 – Mix the minced turkey and sausage meat in a large mixing bowl and mix thoroughly. Easiest with your hands, use a spoon if you’re squeamish! – Add the eggs and mix until thick and smooth. – Mix in the onion, cranberries, chestnut puree and breadcrumbs and seasoning and mix until everything is evenly distributed. 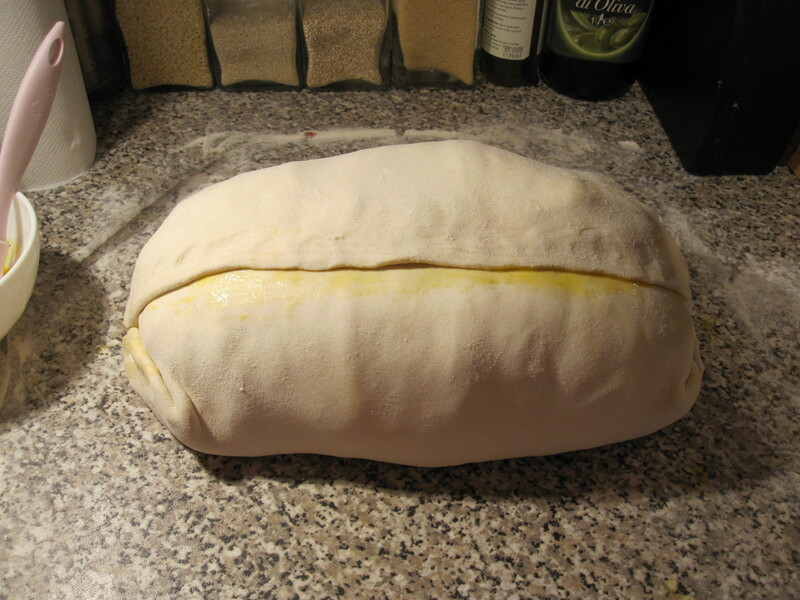 – Roll out your pastry on a floured surface until it is about 45cmx45cm. Size it up so it will wrap around your turkey. 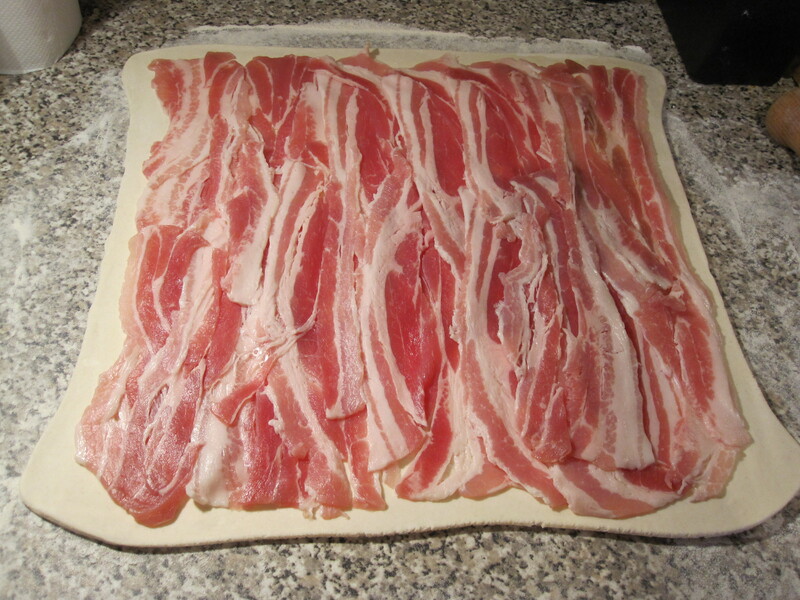 – Place your bacon over the pastry, laying it so there are no gaps, leaving a few centimeters at the edges. Keep back about 5 rashers. 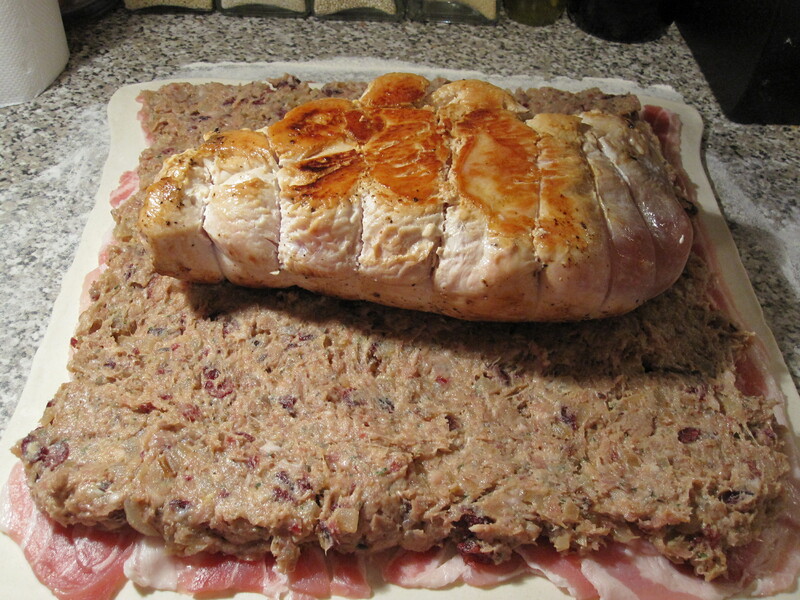 Cover the pastry in bacon.- Spread the stuffing over the bacon, reserving a few heaped spoonfulls. Spread the stuffing over the bacon. 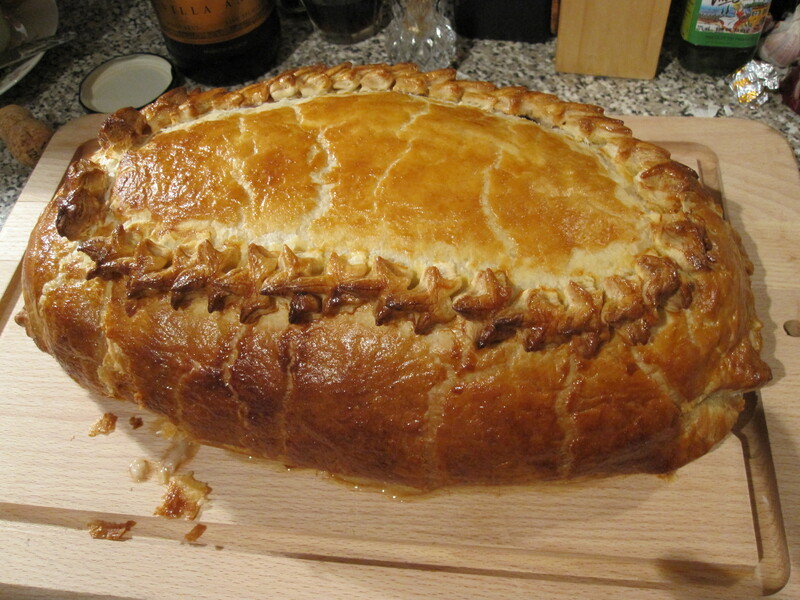 – Place the turkey in the centre of the pastry, topside down. Place the Turkey in the centre topside down. – Spread the remaining stuffing on top of the turkey. 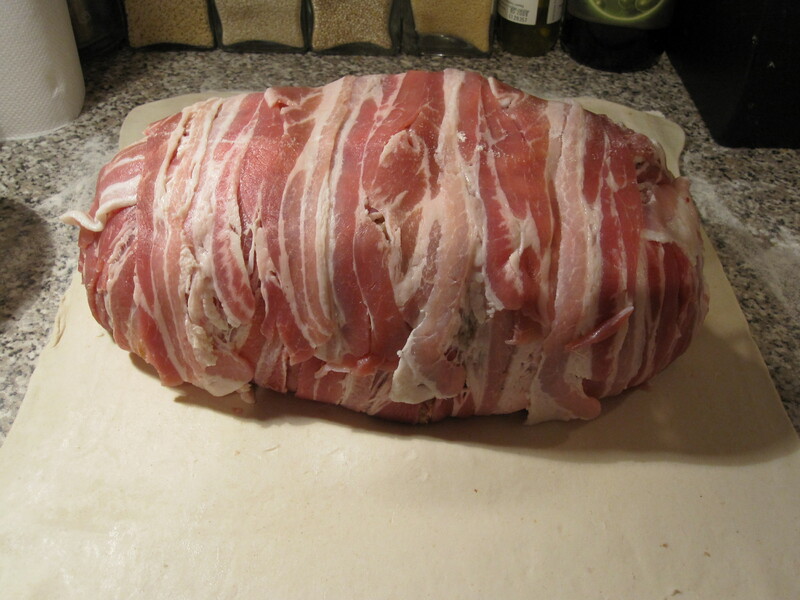 – Gently pick up the bacon and fold it over the turkey. Do this a bit at a time, pressing it to hold it in place. – Use the remaining 5 bacon rashers to cover the gap. 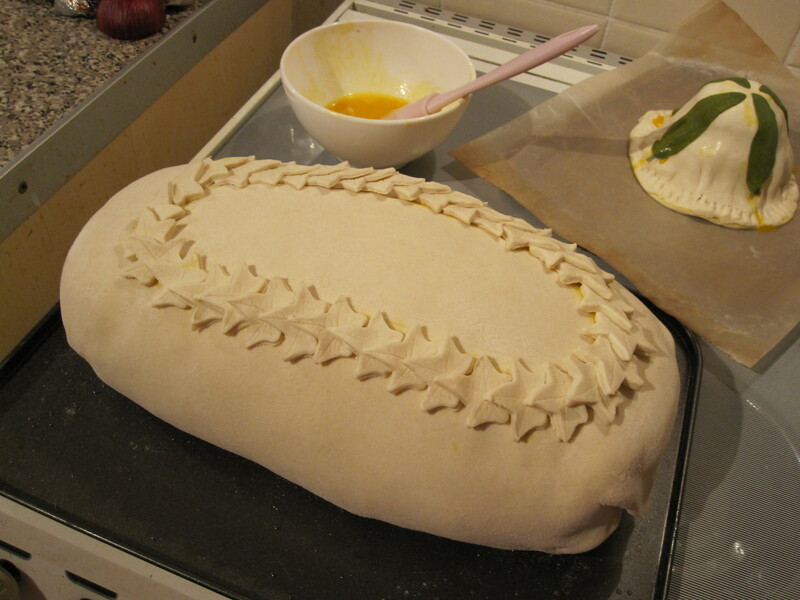 – Fold one long side of the pastry up and over the top. – Brush the edge with egg. – Fold the second edge up and press to seal the two edges together. – Now brush the sides with egg and fold up, press to seal. – Next, carefully roll/lift it onto a greased baking tray. – Use the egg to stick any decorations you want to the top. Flip onto tray and decorate! – Set aside until you want to cook it. – Preheat the oven to Gas mark 6/200C. – Brush with egg and pop it in the oven for 1 hour 25 minutes. Unfortunately there’s no way to check it for doneness so if you happen to cut into it and it looks a little pink, bung it back in the oven. – After the 1 hour 25 minutes take it out of the oven and leave it to rest for 20 minutes. – Use two large fish slices to carefully lift it onto a carving board. Serve with as many trimmings as you wish! For the finale I wanted something that screamed Christmas but wasn’t something traditional. Again, it also had to be something I could prep beforehand and set aside. This produced all of the “Wows” I could have wished for when I brought it out at the end of the meal. Even my dad was tempted to eat some and the man hates desserts! I have to say it was delicious! Despite the fact that it’s made of cream and sugar it’s actually a very light dessert. The perfect end to a gluttinous meal! – Put most of the cranberries in a small pan with 150g of the sugar. Keep back 16 or so for the garnish. – Cook the cranberries in the pan with a lid on until the sugar melts and bubbles. Cook for ~10 minutes until the cranberries are soft. They will pop, do not scream like a girl (ahem) when they do so. – Use a spoon to mash them up once they are cooked. – Whilst they are cooling take a large mixing bowl and pour 200ml of the cream and the remaining 50g sugar into it. – Use a hand mixer to beat until the cream forms soft peaks. 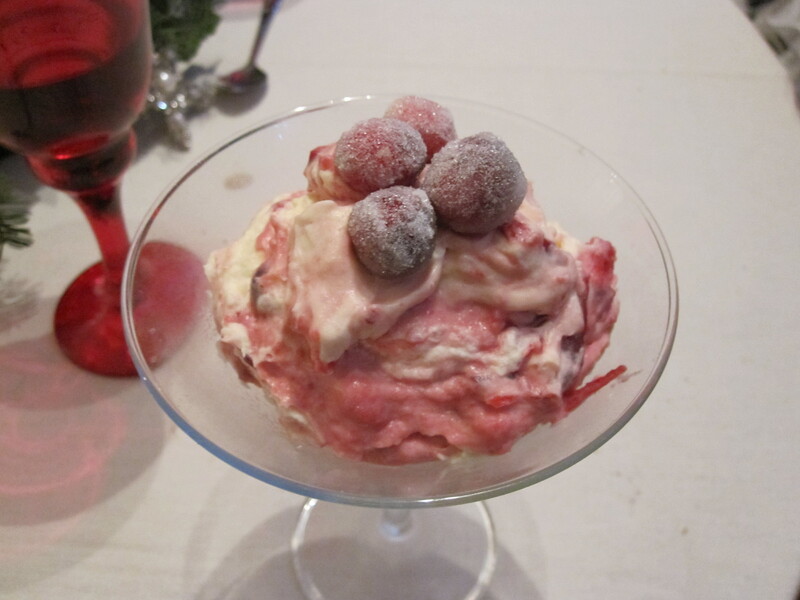 – Stir the remaining 200ml cream into the cranberries until a wonderful pink colour. – Tip this pink mixture on top of the whipped cream. – Stir through only a few times to acheive a marbled effect. – Spoon into four cocktail glasses. – To garnish take the remaining cranberries and dip them in the egg white. – Put the 3 tbsp sugar on a plate and drop the cranberries onto the sugar. Roll around until evenly coated in sugar. – Set aside to set. – Once hard, plce a few cranberries on each dessert. – Chill until ready to serve. 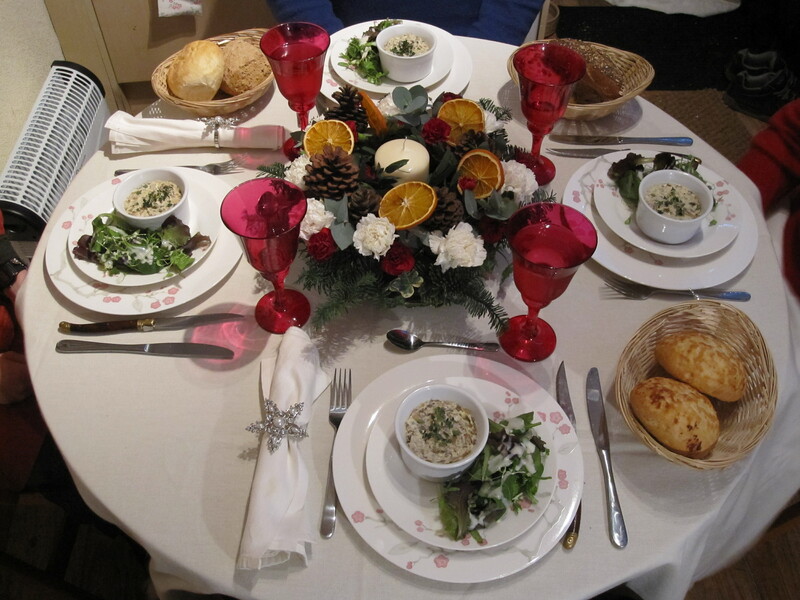 I will be hosting my first proper Christmas dinner later today (Well, pre-Christmas but still!) and I am franticaly working to get it all ready, I’ve got some , hopefully, yummy recipes to post up afterwards, fingers crossed it all works! 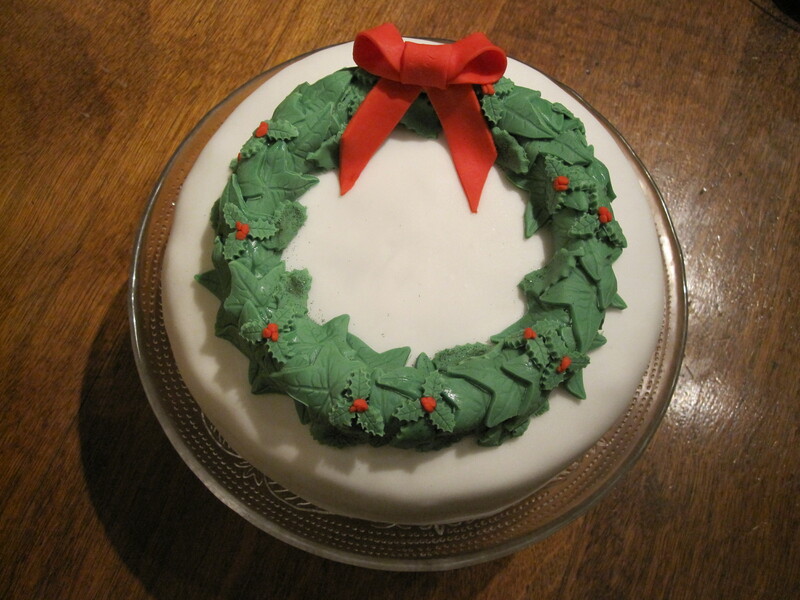 However, I thought I’d take a quick break to post a picture of my Christmas cake. I’ve made two others for my colleagues but this one is all mine! Right, now back to it… why did my sister decide to turn veggie this year? She couldn’t have waited til new year? Ah well, she’s stuck in Exeter at the minute so I may have a delicious vegetarian main to eat tomorrow! Hopefully though everyone will arrive safely and the food will all be ready in time. Wish me luck!